One year ago at this time, Florida citrus growers couldn’t wait for the season to be over. USDA forecasters were estimating a historically low crop output for a campaign marred by post-Hurricane Irma stress and the ongoing grind of greening. 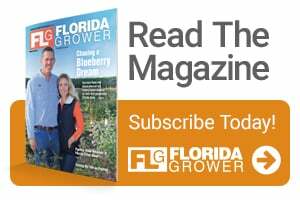 Fast forward to today, and the outlook is markedly brighter in comparison despite a slight drop in the latest, recently released Florida citrus crop estimate from the government agency. The April numbers came in at 76.5 million boxes of oranges (30.5 million boxes of early, mid-season, and Navel varieties + 46 million Valencia). The figure includes a 500,000-box deduction in non-Valencia varieties. The reduced overall tally is only the second since the season’s first report was released in October at a somewhat surprising 79 million boxes. The grapefruit tally also was squeezed another 500,000 boxes, lowering it 9% from last month and now stands at 4.9 million boxes total. Nearly 20 years ago, Florida orange and grapefruit harvests were setting records with 244 million boxes and 49.5 million boxes respectively. The next USDA crop estimate is scheduled for May 10. The season will wrap up with a final report in July.